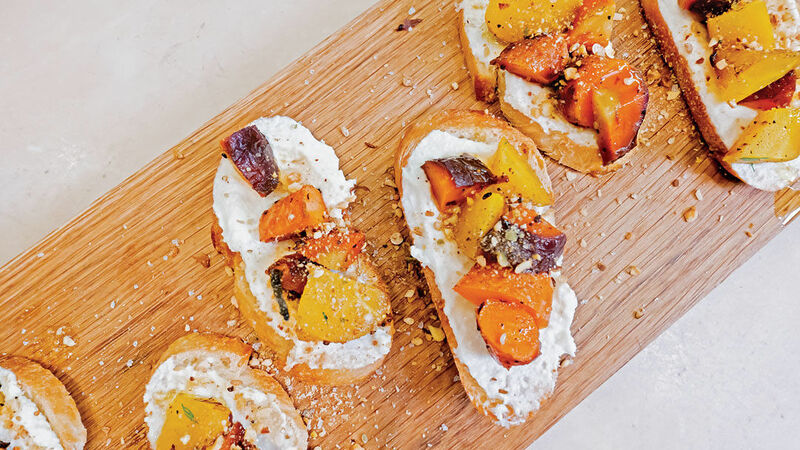 The flavors of the Middle East, earthy roasted carrots, and sweet, creamy ricotta create something special in this easy crowd-pleasing starter. Put the carrots on a large rimmed baking sheet, and toss with 3 Tbs. of the oil, the dukkah, 1 tsp. kosher salt, and 1/2 tsp. pepper until well coated. Roast until fork-tender, 35 to 40 minutes, stirring halfway through. Meanwhile, in a medium bowl, mix the ricotta, honey, the remaining 1 Tbs. oil, 1/2 tsp. kosher salt, and 1/4 tsp. pepper. When the carrots are cool enough to handle, cut into 1/2-inch pieces, and transfer to a medium bowl. Spread a slice of baguette with 1-1/2 to 2 Tbs. of the honey-cheese mixture. Top with several pieces of carrot, and garnish with flaky sea salt. Repeat with the remaining bread and topping, transfer to a platter, drizzle with oil, and serve. My husband and I are not in agreement over the rating here: I want 2 stars, he wants 3.5 stars. Whatever. We made this for a party where 2/3 of the platter (1 recipe) weren’t touched. Multi-colored carrots were a mystery ingredient to the guests; visually, the carrots were beautiful. The problem with this recipe (for us) is that it’s almost one-note: mild, sweet ricotta on mild sweet baguette, and mild sweet carrots roasted in mild olive oil with dukkah (I made Ottolenghi’s dukkah recipe which is a rich, brown color). The magazine photo looks like dukkah was sprinkled over the tops of the bruschetta—recipe doesn’t say to do that. The flavors feel flat and desperately need MORE salt, or better, lemon juice/zest over the carrots or in the ricotta. Tho’ the carrots by themselves are delicious and spicy, when out on bread and ricotta, they go flat. This recipe needs kick, a punch —whatever will heighten the flavor! Even flavored baguette (like rosemary) would help. Very disappointing.